The world's first streamlined train was the Windsplitter, built for the Baltimore & Ohio Railroad in 1900. The tender and coaches were modified by the addition of side valances although the engine itself was not streamlined. The trial was judged to be a failure though, as it did not prove its owners belief that reducing wind resistance would result in very high speeds. Wind resistance is very small compared to other parts of a locomotive that produce friction - such as the wheels against the rail and the motion of the engine, but, as small as it is, wind resistance increases with the speed of the train. British designers regarded wind pressure to be negligible for speeds up to 60 mph. The early 1930's saw the Bugatti streamlined racing cars and he also designed a streamlined railcar for use in France and in 1934, two American railroads were operating long distance streamliners. Because of this, many railway operators from several other countries wanted to update their image and introduced streamlined trains. 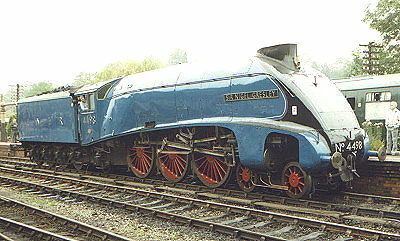 In Britain, after exhaustive air tunnel tests, the London, Midland and Scottish Railway introduced 23 streamlined 'Coronation' class locomotives, and the London and North Eastern Railway built its A4 Pacific's - one of which, Mallard, was destined to gain the world speed record for steam locomotives of 126.4 mph. One effect noticed with the streamlined locomotives, especially with the LMS Coronations, was that side winds were much more of a brake than head winds as the surface area of the side of the engine was greater than in its unstreamlined state. This caused the wheel flanges to grind against the rails and give servicing intervals for the engine a higher frequency. Although streamlining was removed from the Coronation class after World War II, the LNER increased their stock of streamlined locomotives to include East Anglia. The Great Western meanwhile, did not believe in streamlining but to keep in the publicity race, asked their Chief Mechanical Engineer, C.B. Collett, to modify two locomotives, Castle class no. 5005 Manorbier Castle and King class no. 6014 King Henry VII. The designs he produced were described as "ungainly", with a bulbous nose fitted to the smokebox door, and within a few years all of the modifications were removed. At the highest speeds, especially when there was a headwind, streamlining did produce a slightly higher speed for the same amount of energy, but it was not until the era of the 'High Speed Train' where streamlining gave substantial fuel savings, that the technique really justified itself.